"San Cristobal Valley, 1934" "Mountain Nocturne"
30" x 36" 10" x 12"
"Near Chimayo" "Springtime in the Valley"
16" x 20" 24" x 20"
18" x 14" 30" x 24"
"Pueblo Mother and Child" "Sunset on Mesa"
"Road to the Canyon" "Adobes Sage"
I first became aware of the art of Elmer Turner around 1996. I was attending an auction at a hotel in Santa Fe on a Sunday afternoon. This was one of those sales with a lot of art you had seen before hanging on some gallery wall for too long. However, one piece stood out, a fairly large oil on canvas titled "Black Mesa" that sat over in the corner signed Elmer Turner. I was immediately taken by the bold brushwork and strong palette, an almost surreal landscape with billowing clouds along the lines of what one normally associates with the best of Ernest Blumenschein. In the foreground of the painting sat a small adobe, quietly contrasting the powerful and towering mountain. Ed Lineberry, a collector from Taos won the bid and I was the underbidder. This painting is now in the collection of the Taos Art Museum and has sent numerous collectors to my gallery in search of work by this elusive artist. When I began searching for the work of Elmer Turner, the typical response to his name was a blank stare. The well informed would say "Oh, he was married to Ila McAfee." Sometimes this was followed by "heard he got sick" but not much else. I started looking for the work for my gallery, buying and always being able to sell everything I came across. Since then not much more information has come forth. Although Elmer Turner lived to be 76, he was paralyzed and in a wheelchair by the time surviving family members first remember him. His speech was also affected and he could only talk in a whisper. His vivacious wife, Ila McAfee was a lively conversationalist who did most of the talking and entertained the visitors while always caring for Elmer. What is known is that Elmer Turner was born in Wyoming in 1890. In 1899, the family moved to Greeley, Colorado where his mother worked for many years as an assistant librarian. Turner may have studied art before being shipped to France where he served as a second lieutenant fighting in the first world war. A surviving sketch signed "TURNER, FRANCE," shows considerable academic influence. If his experiences in France include anything other than sketching between battles it is not known. He was gassed and shell shocked in that war, injuries which would later incapacitate him with a gradual paralysis. By 1920, Turner was in Chicago studying at the Art Institute and with James E. McBurney, a noted muralist. McBurney only had three students and one of these, a pretty young woman from his home state was Ila McAfee. They worked side by side on McBurney's mural commissions. Ila later said that Elmer would paint the landscape and she would add the figures. In this exciting setting Ila and Elmer fell in love. They were married at the McAfee ranch in the Cochetopa Valley near Gunisson, Colorado in October, 1926. Their mentor, James McBurney, was in attendance. He and the newlyweds left immediately, traveling together to work on a mural for the Los Angeles County Museum. On the way they detoured through Taos, the famous art colony Ila had heard about from a friend. In Taos, they were immediately enchanted. The first artist they met was Leon Gaspard who was painting in a field on the north side of town. The first night they slept under the stars, staying at a campground on Armory Street called Burch Camp. October being quite cool, they rented a small two room house on the La Loma Plaza and began introducing themselves around town. Ila recalled that Elmer was not shy and they went door knocking, meeting the artists Blanche Grant, Oscar Berninghaus, Ernest and Mary Blumenschein, Victor Higgins, and Martin Hennings. They were immediately captivated by the landscape and the picturesque adobe town. The art and the ambiance of the tiny village was unlike anything that they had seen. The plaza of Taos with its blanket wrapped Indians seemed an exotic world apart from their home in Colorado. With plans to return, they left Taos in their new Ford touring car for the job in Los Angeles. The first winter of their marriage they spent working in California where the mural took two months to complete. This lengthy trip yielded several surviving paintings by Elmer Turner, all seascapes of the California coast which show him quite the capable painter. Both Elmer and Ila were ready to take on the art world by this time, their days of training completed. Soon after their return from California in the spring of 1927, Elmer achieved his first success, winning acclaim for the painting of a cover for a major national news magazine. The remainder of that year was spent working and painting in Colorado, but Taos beckoned. 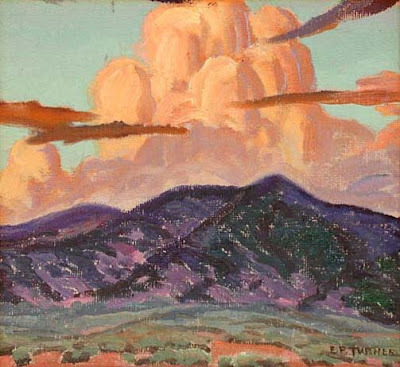 The allure of Taos was persistent and by 1928 Elmer and Ila had taken their nest egg of $250 and moved to the thriving art colony. They purchased a lot on Armory Street near where they had camped on their first trip and began building a Pueblo revival style adobe home. The Turners spent that first summer with two carpenters, an adobe brick layer, and a plasterer. The home was built free hand with Ila and Elmer designing as the building went up. It was complete by Christmas 1928 and was depicted in an illustrated letter sent to friends back in Chicago. 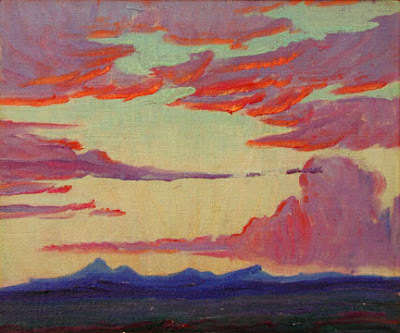 This industrious start of Elmer Turner's art career in Taos was to be all too brief. Within ten years of the completion of their new home, Turner became completely paralyzed. He was most likely a victim of multiple sclerosis brought on by exposure to poisonous gas during the war. However, he completed quite a number of wonderful paintings during this brief time. Of the known works, several stand out. "The Padre's Gate" painted in 1928, his first year living in Taos, is a strikingly colorful depiction of the adobe village with that icon of Taos, Lucero Peak, looming above. 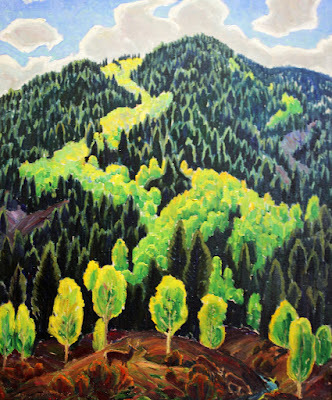 A canvas titled "The Road into the Canyon" is undated but is very similar to a painting now in the Harwood Museum. 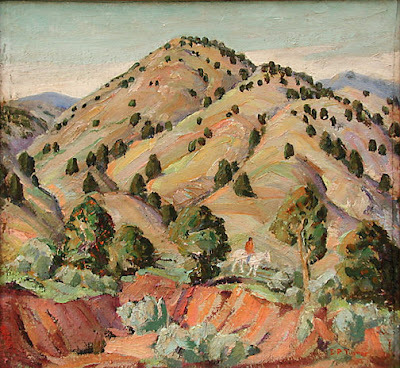 The Harwood piece, called "Cottonwoods in the Canyon," dates from 1928 and donated by the artist. "Seco Valley and Beyond," completed in 1929, begins Turner's series of somewhat bird's eye views of adobe villages of Northern New Mexico. 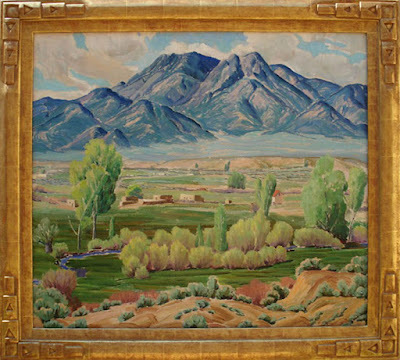 This panorama of the village of Arroyo Seco was followed in 1934 with a large canvas of the San Cristobal Valley, and in 1935, with his most ambitious adobe-filled work titled "New Mexico Village," a view of the valley of Valdez. A large painting in the Blumenschein Museum, dated 1930 and titled "Only Memories," shows the remains of Elizabethtown, New Mexico, the site of a once thriving mining center in the Merino Valley near Angel Fire. In 1931, Turner won first prize for landscape at the Arizona State Fair in Phoenix for a painting titled "Rio Grande." During 1932, Turner produced "Dark Mesa," the painting now in the Taos Art Museum. He and Ila used "Dark Mesa" on a postcard to friends for Christmas of that year. In 1938, possibly Turner's last year of good health, his work "Chimayo, New Mexico" was purchased by the Denver Art Museum. With the demise of Turner's physical ability there was a lapse of interest in his work. Mabel Dodge Luhan pictured him in her book Taos and It's Artists, praising his ethereal landscapes and devoting a half page to his enduring personality but did not include any of his artwork. In spite of the affliction which ended his art career, Elmer Turner is remembered by many for his humor and cheerfulness during those long years. He would always name Ila's paintings and often write knowingly bad poetry for their Christmas cards. Elmer Page Turner takes his place among those great painters who came to Taos during the heyday of the art colony. A life now best remembered by the art left by this colorist of Taos. Parsons does not offer Elmer Turner prints, because no print can compare to the real paintings.